The Middle East saber-rattling heightened Friday as Iran's Revolutionary Guards fired salvos at the West and claimed the United States could not frighten them out of blocking the strategic Strait of Hormuz. The Islamic Republic of Iran does not ask for the permission of any country for implementing its defensive strategies, a top leader of the Islamic Revolution Guards Corps (IRGC) said, Fars news agency reported Friday. Brigadier General Hossein Salami, Lieutenant Commander of the IRGC, was responding to the U.S. position that any move by Tehran to block the Strait would not be tolerated. The US is not in a position to affect Iran's decisions ... The Americans are not qualified to give us permission for carrying out our military strategy, he said. Iran's alleged nuclear bomb has always induced bitter war rhetoric in the past, but of late, the cacophony has evolved into a sharper indicator of an impending military tussle, especially after the U.S. said in unambiguous terms it would not let Tehran develop a nuclear warhead. In Tel Aviv, newspapers are taking it for granted that an attack on Iranian nuclear installations will take place soon. While reporting the visit of Martin Dempsey, chairman of the U.S. Joint Chiefs, to Israel, the Jerusalem Post wrote as follows: Dempsey will arrive in mid-January in a trip that comes as the U.S. escalates its rhetoric regarding U.S. military preparations to attack Iran's nuclear facilities. 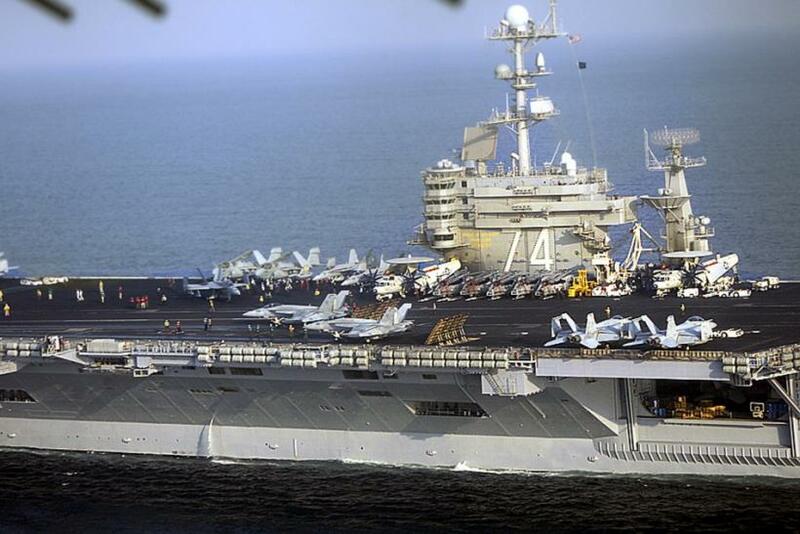 Even as the U.S. served a stringent warning to Iran over its threat to choke off the Strait of Hormuz, Teheran is holding a 10-day military drill in international waters off the Strait. For the United States, certain actions by Iran will set in motion an irreversible chain of events that could culminate in an attack on the fourth largest oil producer in the world. The U.S. has reacted sternly and angrily to Iranian threats that it would block the Strait of Hormuz, a 6.4-km wide waterway between Iran and Oman through which more than a quarter of the world's tanker-borne crude passes. The United States has said such an action by Tehran would not be tolerated as it undermines the navigation freedom. A U.S. Fifth Fleet communiqué said: Anyone who threatens to disrupt freedom of navigation in an international strait is clearly outside the community of nations; any disruption will not be tolerated. Interference with the transit or passage of vessels through the Strait of Hormuz will not be tolerated, said George Little, Pentagon press secretary. For Israel and the U.S., Iranian nuclear bomb is the ultimate trigger for an attack. U.S. Defense Secretary Leon Pannetta said in a CBS interview that all options were on the table when it came to stopping Tehran from developing a nuclear bomb.If they proceed and we get intelligence that they are proceeding with developing a nuclear weapon, then we will take whatever steps necessary to stop it, said Pannetta. Another strong indicator of a potential attack on Iran is the increasing military readiness of Israel. There is no doubt a nuclear-armed Iran is the nemesis of Israel and Tel Aviv will go an extra mile to ensure Tehran doesn't get there. A recent Jerusalem Post article says Israel is ramping up military readiness in view of an impending conflict in the Middle East. Israel is moving forward with plans to hold the largest-ever missile defense exercise in its history this spring amid Iranian efforts to obtain nuclear weapons, Yaakov Katz wrote in the Post. Last week, Katz wrote, Lt.-Gen. Frank Gorenc, commander of the U.S.'s Third Air Force based in Germany, visited Israel to finalize plans for the upcoming drill, expected to see the deployment of several thousand American soldiers in Israel. The article says the exercise will include the establishment of U.S. command posts in Israel and IDF command posts at EUCOM headquarters in Germany--with the ultimate goal of establishing joint task forces in the event of a large-scale conflict in the Middle East. The U.S. has made it amply clear the military option will be the last to be exercised and Iran has insisted its nuclear pursuit is for peaceful purposes. But the fact is that the role of Israel in the Middle East nuclear puzzle is largely an unpredictable element and there is far less clarity on Israel's course of action than about the U.S. stance. Earlier in the month, Reuters reported that two key U.S. senators said there were gaps in U.S. knowledge about Israeli leaders' thinking and intentions. I don't think the administration knows what Israel is going to do. I'm not sure Israel knows what Israel is going to do ... That's why they want to keep the other guys guessing. Keep the bad guys guessing, said Senator Carl Levin (D-Mich.). However, former presidential candidate John McCain has said that Israel knows what it is up to, but that the U.S. administration doesn't have a clue as to what exactly Tel Aviv is planning to do. I'm sure (administration officials) don't know what the Israelis are going to do. They didn't know when the Israelis hit the reactor in Syria. But the Israelis usually know what we're going to do. Israel hasn't clearly said it will attack Iranian nuclear installations soon, but they haven't ruled that out as well. Neither has the U.S. done so. Analysts have pointed out that despite Israel being U.S.'s favored client state in the region, there have been occasions when Tel Aviv didn't inform Washington about its drastic moves. There are plenty of instances when the Israelis have undertaken action without informing the United States first. So not always should we assume a level of coordination in advance on all issues, Reuters quoted a former U.S. government official as saying. For Israel, a nuclear armed Iran is the end of the road and they will go a dangerous mile to preemptively strike Iran. When that happens, if it does, the rest of history is pretty much predictable. Iran has made it clear that an Israeli attack will set off retaliatory strike on Tel Aviv as well as U.S. military bases across the region. It will also close the Strait of Hormuz, snapping fragile balance and triggering irreversible military engagement.